Spice up your winter wedding with a Christmas wedding idea. The holidays mean spending time with family and friends. Take advantage of the holiday cheer by having your wedding around Christmas. Browse the list below for our favorite Christmas wedding thoughts. This is a long list, so you may want to bookmark this page so it is easy to return later. Most reception spaces decorate for the holiday season, so you may be able to take advantage of their decorations. Look at Inns and Bed & Breakfasts, lodges, country clubs, historic sites and anywhere else that has a fireplace and reminds you of Christmas for your wedding location. Many invitation designers offer Christmas designs which will help to set the tone for your Christmas wedding. Visit Snowflake Wedding Invitations and Winter Wedding Invitations for some ideas. Winter Wedding Programs are the perfect way to kick off your wedding ceremony. For reception decorations, use mini balsam and evergreen trees (real or fake) with white lights and ribbons. Instead of a plain old seating card table, consider having a place card tree. Get a mini or full-sized evergreen tree (depending on how many guests you will have) and plant the tree in an ice bucket if it is a small tree. Hang small crystal ornaments from the tree along with other decorations that fit the size of your tree. Get small place cards and hang them on the tree with wire ornament hangers in alphabetical order starting at the top. Have the tree available at cocktail hour so a long line doesn't form at the entrance to the dining area. If you are looking to make a dramatic exit from your winter wedding reception, arrange to have a horse drawn sleigh whisk you away into the night. This is, of course, dependent on whether you are in an area that has plenty of snow. 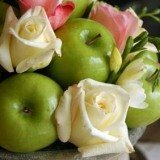 Even though you are getting married in winter, there are still some beautiful options for flowers. 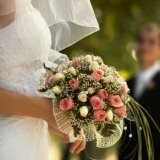 Visit Winter Wedding Flowers for some holiday ideas. Pine cones are another holiday favorite that have many uses. Use them in your centerpieces along with Holly berry, multi size red and green pillar or taper candles and other winter flowers. Gingerbread houses are a Christmas wedding idea favorite. You can use them as centerpieces and decorations at the reception. If you are creative (and have the time or a lot of helpful friends) you can make them yourself or buy them from a bakery. A great Christmas wedding idea for centerpieces is to take mini pine cones and walnuts, spray paint them silver and arrange them in silver bowl. You can add some color if you want with a red ribbon or by adding colorful small round glass ornaments. Visit Christmas Wedding Centerpieces for more tips. Winter Wedding Cakes are not only fun, but they taste good as well. Finish off your cake with a Christmas themed wedding cake topper. Scented pine cones are a great Christmas wedding idea for favors. Another option is wax-dipped pine cones that guests can take home to help start a fire in their fireplace. Gingerbread mix in decorative tins or packaging can be a lot of fun, and small gingerbread houses can double as centerpieces and favors. Christmas ornaments always make great favors, and they can also double as place card holders. There are many varieties of glass and crystal ornaments that are very elegant. A Christmas wedding isn’t complete without a signature drink. Peppermint schnapps make the perfect wintertime warm up for your wedding guests. Get a few 15-inch silver punch bowls, and fill them with ice or snow if available. Take long double-shot glasses and fill them with a peppermint schnapps shot, and place them into the bowls filled with ice. Add a white peppermint candy cane to each shot glass, and let your guests enjoy. Check out Wedding Signature Drinks for more options.